Q) Michael Stanley is the pen name for a writing partnership of Michael Sears and Stanley Trollip. For the readers can you give us a brief summary of yourselves and your latest release Dying To Live? A) Michael is a professor of computer science at the University of the Witwatersrand in Johannesburg and Stanley worked in academics and industry in the US. We’ve been friends for nearly forty years, and we had a concept for a crime novel set in Botswana which became our first book – A Carrion Death – first published ten years ago. Our protagonist is David “Kubu” Bengu – a detective in the Botswana CID in Gaborone, whose nickname Kubu means hippopotamus in the Setswana language and that says it all. He’s very large, likes his food, but don’t get between him and his objective or you’re in trouble. The books all have backstories of issues important in modern day southern Africa – blood diamonds, the legacy of the war in Zimbabwe, the plight of the Bushman peoples of the Kalahari, murders for body parts for black magic, and the growing Chinese influence. In the latest book – Dying to Live – the backstory is the idea of a plant in the Kalahari that prolongs life, and the greed of all the people who would like to get their hands on it. Does it really exist? Well, it might. And it really doesn’t matter because once people believe it does, their greed will stop at nothing to get it. Nothing at all. Q) I have many writing partnerships I admire, one of my favourites is Lars Kepler. How does this work in terms of planning a novel and the creation of a plot? A) We’ve developed a strategy which we think works well for us. Upfront, we work out a map of the plot, a synopsis, and the timelines. We try to get together to do that, and it takes a considerable amount of time. After that, it seems there are usually areas where one of us has a particular interest or a mental picture of what’s going to happen. He’ll write a first draft, and that is the starting point for multiple iterations. Often we will each be working on a different section of the book. This phase we can do by email interspersed with long internet telephone conversations. Eventually we go through each section independently to make sure it’s smooth, stylistically coherent, and that the characters’ behaviours are consistent from one place to another. Perhaps surprisingly, it seems to work. Most people can’t discern any changes of style as they read. Overall, we think that writing together is slower than writing alone, but the benefits of having an immediate, interested reader and someone with whom to brainstorm far outweighs the drawbacks. And we have a great deal of fun! Q) The series of novels is based in Botswana and has been described as sunshine noir. What was the inspiration behind the location? A) Our first book required that a body be completely destroyed without trace—partly to hide the identity of the murderer and partly because it was crucial that no one ever found out who the victim was. In Botswana, it’s possible to drive out into the bush, throw out a corpse, and have the hyenas completely consume it, leaving no evidence behind. That would be much harder to do in South Africa. 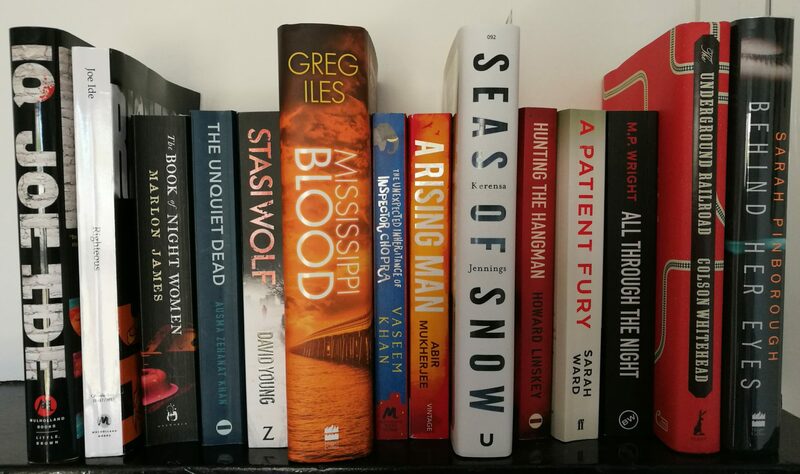 And we’re very pleased about our choice, because while there are many great South African mystery writers, we have a chance to explore the sorts of issues we mentioned above without the aftermath of apartheid colouring the whole story. Q) One thing I absolutely love in literature is the ability to go globe-trotting from the comfort of my arm chair. One of my recent purchases includes the first in the series by Deon Meyer, set in Cape Town. I am also currently reading the Varg Veum series by Gunnar Staalesen set in Norway. Where are your favourite locations, in what you read? Michael: I read a lot of African mysteries partly because I like their difference and the Sunshine Noir genre as a whole, and partly because I write a monthly column for the ITW magazine The Big Thrill called Africa Scene which explores recent mysteries and thrillers set in Africa. Other than that, I don’t think I have a geographic preference. If it’s good, I’ll read it! Stanley: I like to read mysteries that give me both a strong sense of place and a memorable protagonist. A good test for these mysteries is that one cannot transplant them elsewhere; that the place has a profound impact on the story. A good protagonist is like a good friend–you develop an emotional attachment and want to get to know them better, warts and all. Q) The location of the central Kalahari game reserve, instantly sounds atmospheric. How do you fully transport that onto the pages of a novel? A) It’s a good question. One way is that we always visit everywhere in Botswana that we write about. We spend time there, try to get a feel for the place and the lifestyle of the people. We’ll probably write a few pages about it too. Very little of that actually gets into the final book, but we think that having that background makes our writing more genuine and gives a more authentic feel to the reader. Beside which we love exploring Botswana! Q) The novel has themes of greed, corruption and ruthless thuggery, wrapped around a very cleverly thought out plot. How is this constructed within the writing, do you develop a plot/crime first and themes secondary? Or do you get a sense of the emotions of the theme and the crime grows from there? A) We think it’s both. Basically we are ‘pantsers’. We like to have a basic structure—a theme, if you like—and then let the characters explore if for us. We often don’t know who the bad guy (or gal) is going to be until well into the book. That often only emerges once we know the characters much better. Eventually one emerges as the villain, trapped by his or her lies. Sometimes Kubu detects these before we do! Q) What’s next for Detective Kubu Bengu? Is there a next novel planned? A) One of the pleasures of a series—both for readers and for the writers—is to explore the development of the main characters who appear in your novels. In a way, Kubu appears fully formed in A Carrion Death with his wife and respected status in the CID. We think it would be fascinating to understand just how he got there from rather inauspicious beginnings. So the new book is a prequel and starts with Kubu’s first day at the CID. He is overweight, teased, and a complete novice. What’s more he arrives in the middle of a high profile diamond-heist case. No one has much time for him, but Assistant Superintendent Mabaku takes him under his wing. By the end of the story, he’s very glad he did. *Huge thank you to writers Michael Sears and Stanley Trollop for taking part a Q&A on my blog. I wish you all the best with the release of your novel. Thanks very much for the opportunity, Anne! *The novel is released on 12th July in paperback but is available via #Ebook now!